Oakley (then almost 2 years old): Apple! Aspen: The Lord is good to me. 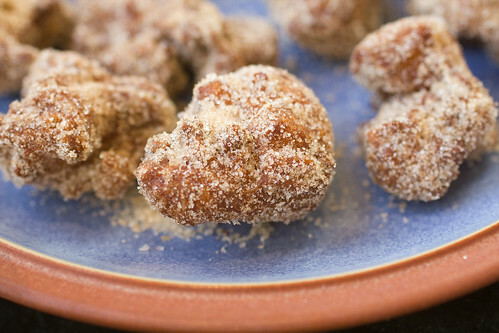 And yay for these apple-cinnamon doughnuts! Don’t know yet what to make for Thanksgiving dessert – other than pumpkin pie, that is? 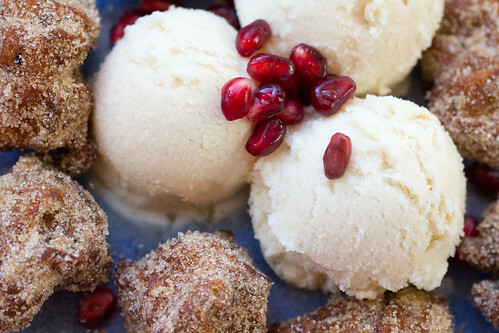 Here’s your answer: cinnamon apple doughnuts. Your family will be thankful. They’re not a bad way to start the day either. These are not yeasted doughnuts. Rather, they’re made from pate a choux, the versatile pastry dough that can baked, boiled, or fried. Baking brings about gougeres (cheese puffs), eclairs (cream puffs), and profiteroles (puffs with ice cream and chocolate sauce). Boiling results in gnocchi. And frying gives you these babies. In a small saucepan over high heat, bring butter and water to a boil. Reduce heat to medium and add flour and salt. Stir until flour absorbs water, becomes a paste, and pulls away from sides of pan. Cook for another 30 seconds. Remove from heat and let cool slightly. Stirring rapidly, add eggs one at a time, and stir until completely incorporated. Let cool. Cook until golden brown and cooked through, about 3-5 minutes. Check if center is set and warm by cutting open a doughnut. (Eat it as your reward.) Remove doughnuts from oil and place on wire rack lined with paper towels and set above sheet pan (or use bowl lined with paper towels). 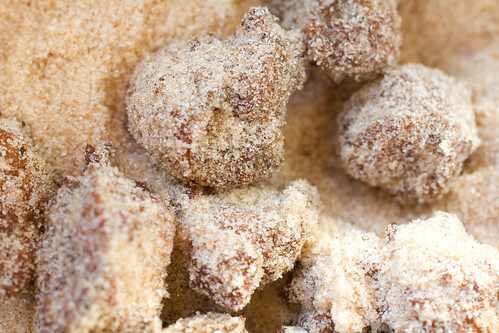 Blot doughnuts and roll in cinnamon sugar mixture. Serve immediately or keep warm in 250°F oven (use convection if you’ve got it) for about 20 minutes. Note: Strain and reuse oil one more time. One Response to "Apple-Cinnamon Doughnuts"
These look scrumptious!!! And what a sweet tradition too, with the prayer-song, that is!